"The New Way To Treat Your Horses Legs"
Equiflexsleeve, a proprietary blend of multi-tensioned fibers infused with antimicrobial technology, acts as a compression sleeve/therapeutic joint support for horses. 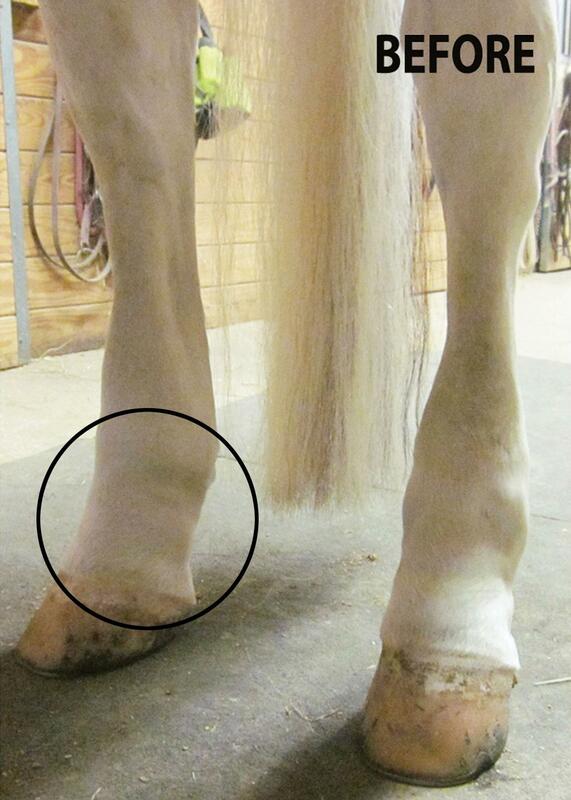 The sleeve fits loosely over the pastern and offers 20-30 mmHg of compression at the fetlock joint when applied to a mildly or moderately swollen leg. The sleeve takes the place of traditional standing wraps and can be worn for longer periods of time than traditional wraps. Unlike traditional wraps, the sleeve allows heat to dissipate, does not immobilize the joints and remains in position as swelling decreases. 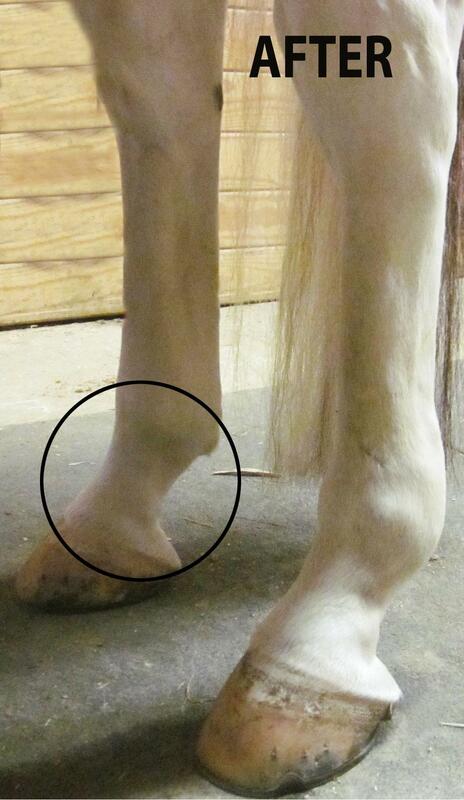 Because Equi flexsleeve has no adjustable straps or fasteners, the element of human error in application is removed. The sleeve comes in seven sizes fitting both front and hind legs and is available in black only. The sleeve is comparable in pricing to traditional wraps. Sold in pairs. Made in America, Equi flexsleeve is knit in North Carolina (Twin City Knitting) and is packaged in Ohio. After more than three years of testing and development, the result is a joint support/compression sleeve that is comfortable for the horse, can be used instead of standing wraps and can be used for longer periods of time than standing wraps. 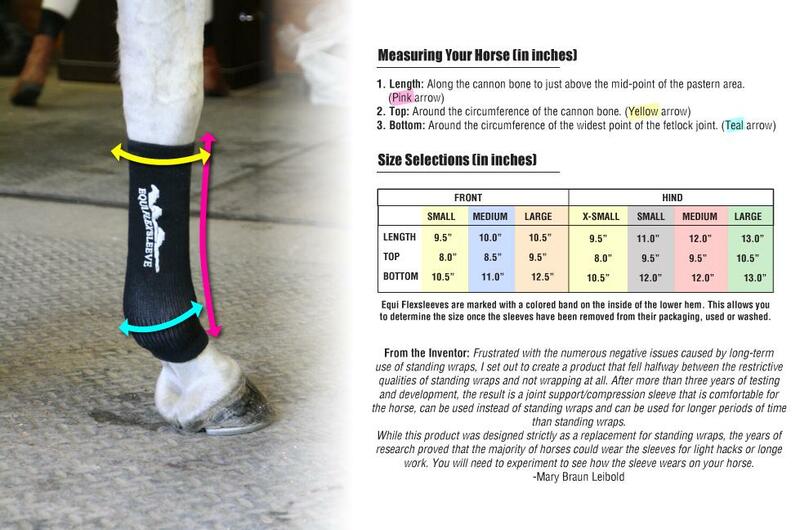 Although this product was designed strictly as a replacement for standing wraps, the testing showed that the majority of horses could wear the sleeves for light hacks or longe work. 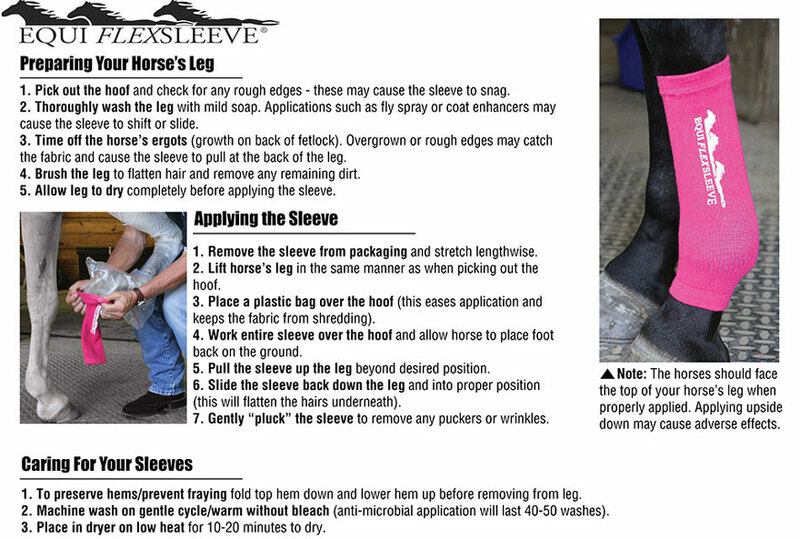 You will need to experiment to see how the sleeve wears on your horse.